One of the many pleasures of a garden is looking at it and walking in or around it. Some of us have planted our own gardens and know the work is hard and never-ending. 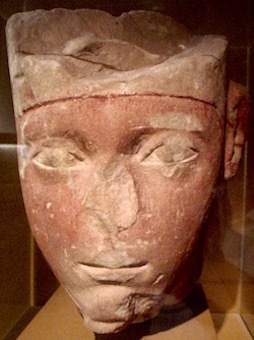 But if you are a Pharaoh in ancient Egypt, you neither planted your own gardens nor tended to “your” gardens. 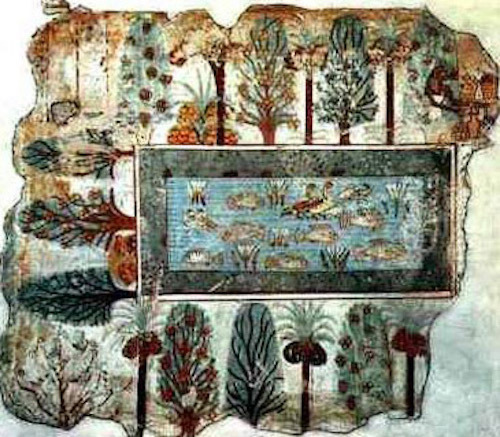 Amenhotep’s gardens and many of the ancient gardens of the wealthy seemed to have been mainly trees and ponds. Nothing has been the same since then. 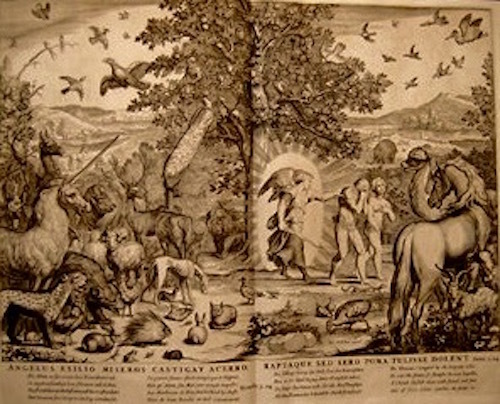 Man forfeited “Paradise,” from an Iranian source similar to Avestan pairidaeza meaning “a park, an enclosure.” (Avestan is within the Indo-European language groups.) 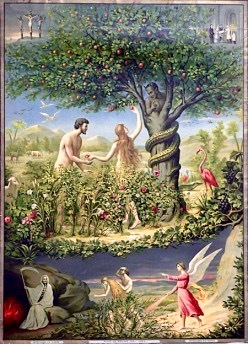 And people have forever been seeking the Edenic state in AND out of their gardens. 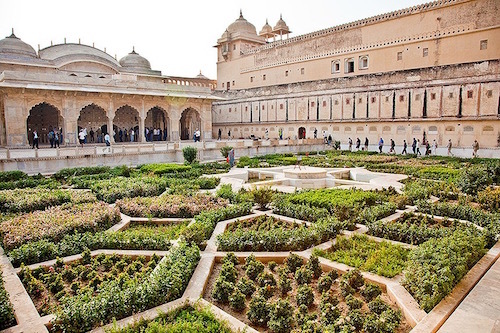 Ancient Persian gardens were legendary. 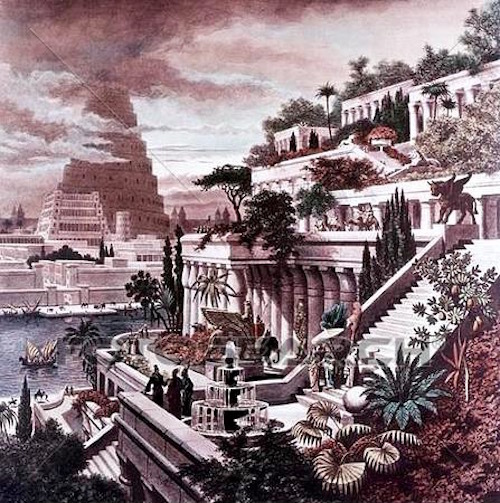 The most legendary and famous garden of the ancient world is the Hanging Gardens of Babylon, one of the Seven Wonders of the Ancient World (left). It was built by Nebuchadnezzar (king of Babylon from c. 605-562 BC) for his wife Amytis, homesick-for-the-greenery of her native Media . 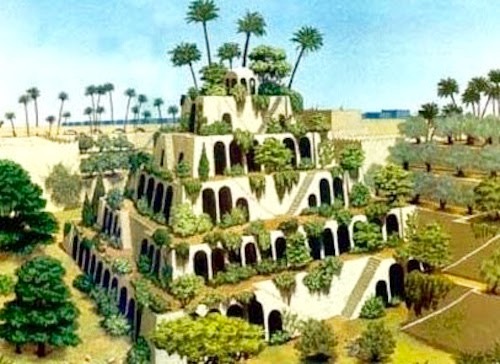 Babylon was just expanses of barren, tan desert, so Nebuchadnezzar who was king of kings in his world, built a c.400 ft wide, c.400 ft long and c.320 ft high Tower of Greenery right there in the middle of the desert. Amytis was very pleased. 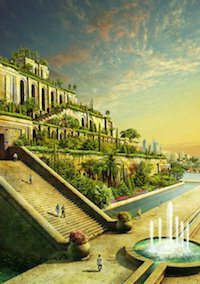 No one has definitely proved how the gardens in the air were watered from the Euphrates River. A stab was made 500 years ago by a Dutch painter (above), but his engraving does not explore the question of HOW. Maybe the Hanging Gardens of Babylon are first responsible for the fame of Persian Gardens (above)? 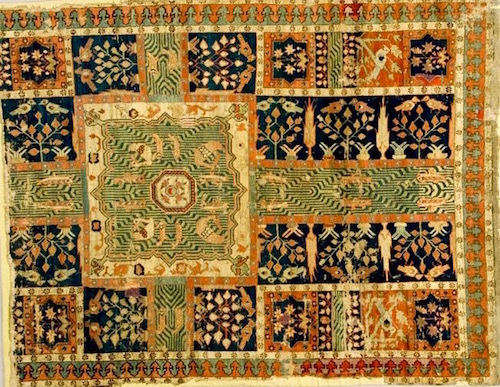 Their Persian Carpets were/are filled with gardens (below). The ancient Persians wove their gardens into their homes or tents and enjoyed them under foot. They sat and enjoyed their pleasing patterns inside living rooms just as they watched their gardens outside. 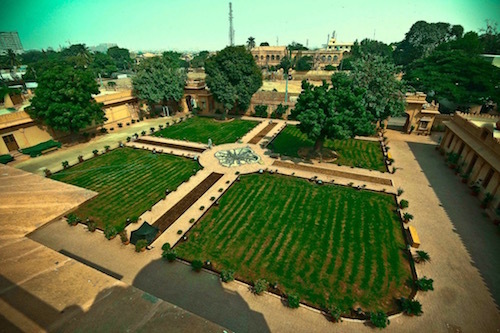 “Charbagh,” meaning “four gardens” Is a Persian/Islamic quadrilateral layout for gardens based on the four gardens in Paradise in the Qur’an. 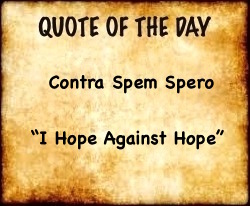 (below). 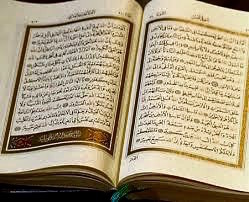 The Qur’an, written between December 609 CE, when Muhammad was 40, and concluded in 632, divides Paradise into gardens bordering those four rivers. 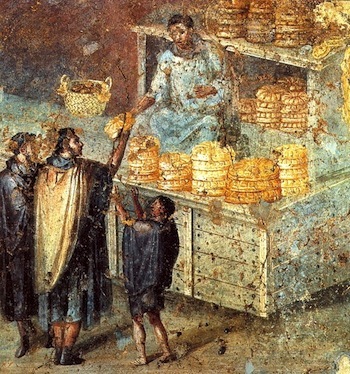 The ancient world loved their gardens as we do today. When we think “gardens,” we often think flower or vegetable gardens. The ancients did grow flowers and vegetables, but for them, gardens were pools of water amid intentionally planted trees and shrubs in a prescribed or proscribed pattern intended to evoke beauty, awe and refreshment.